Totally free. Delivered right to your inbox over five days. 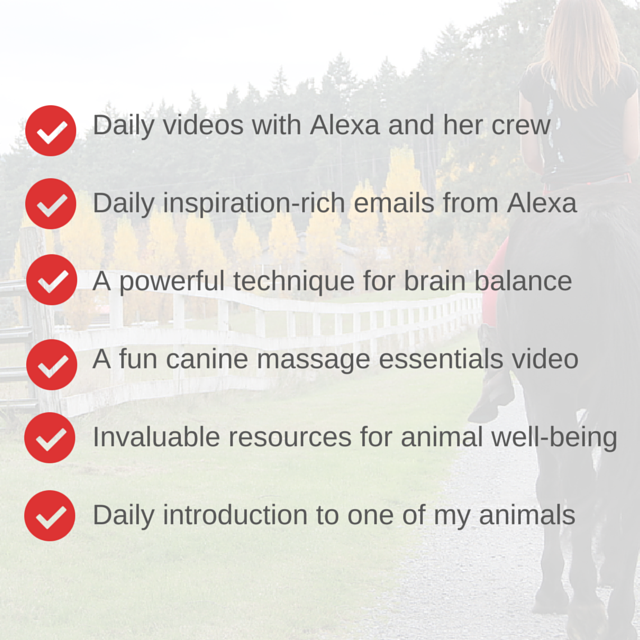 Daily videos, audio, powerful content and loads of inspiration from Alexa, her animals and some dear friends. If you love animals or have animals in your life of any kind (yes, birds and bees totally count) then you are most definitely in the right place! If you’ve ever wanted to know why animals do certain things, act certain ways and what is going on under the surface of those puppy dog eyes, then you’re going to love the next five days. Because, this five day mini-adventure is all about opening our eyes to what animals are really all about (and it’s a whole lot more than you might think) and more importantly, what they have to teach us. You see, with animals, what might be perceived as lacking in “consciousness” or “culture”, they make up for in spades by being deeply present and fully connected, not only to their normal senses of hearing, sight, smell, touch and taste, but to the subtle more intuitive senses as well. Translation? They are crazy tuned in – to their environment and more importantly, to you. You, after all, are pack leader, herd member, or in the case of cats, human slave numero uno. And they’ve got you figured out scarily well. Recognizing that they are this tuned in is step one in really connecting with your animals – now that you know, you can begin the powerful journey of connection possible with increased awareness and understanding. I truly hope you decide to join us. Here’s just a few things that you’ll be enjoying…daily videos from yours truly sharing insights and wisdom developed over a lifetime with animals and over a decade working extensively with animals on an intuitive level, some powerful audio from a dear friend, tons of content and resources compiled with much help from my animal family (you’ll be able to learn more about each of them throughout the course), techniques that you’re going to be able to use for yourself and your animals for years and years to come and more. I’ve loved putting this 5-day online adventure together for you with the help of my furry family, Kia, Parker, Diva and Dream, and as I always do, I’ve added a ton of humour and fun to the mix. I have a great feeling that no matter where you’re at in your human-animal connection, you’re going to leave with a smile on your face, some bubbling inspiration in your being, and some feel-good feelings in your heart, plus, the icing on the cake, a stronger connection with the animals in your life. Mini-adventure is BIG! It really brings to light our connections with animals and I loved the videos (especially the animal communication), and the stories about Diva, Parker, Kia and Dreamweaver. Alexa has brilliantly put together an all encompassing course for animal lovers and how we can be more congruent in ourselves. Alexa’s program explores how we can foster connection with the animals in our lives in a kind and respectful way. I appreciated the explanations and theory as well as the practical tools and real life stories. It was fun and instantly applicable! Alexa, Kia, Parker & Diva. Your mini-adventure was more than mini. What we humans miss by not learning from our animal friends. For me the most profound effect was the horses, your explanation sounded simple, but it’s effect was the opposite. Blessings to you and your four legged family. In love and light Anne.